up twenty-five years ago by a volunteer at ActionAIDS in Philadelphia and is magnificent in its simplicity: More than 3,000 restaurants participate by donating a generous portion of the day's proceeds to support their local AIDS service to fund care, prevention, education, testing, counseling and other essential services. Over US$ 4-million was raised from Dining Out For Life in 2014. Last year, Dining Out For Life licensed AIDS Service Organizations assisted over 350,000 clients, delivered over 1.8-million meals and provided housing for 8,097 clients. Fulfilling vital health services, 5,572 patients received health insurance, 5,491 received pharmacy assistance and 1,948 patients were given dental aid. 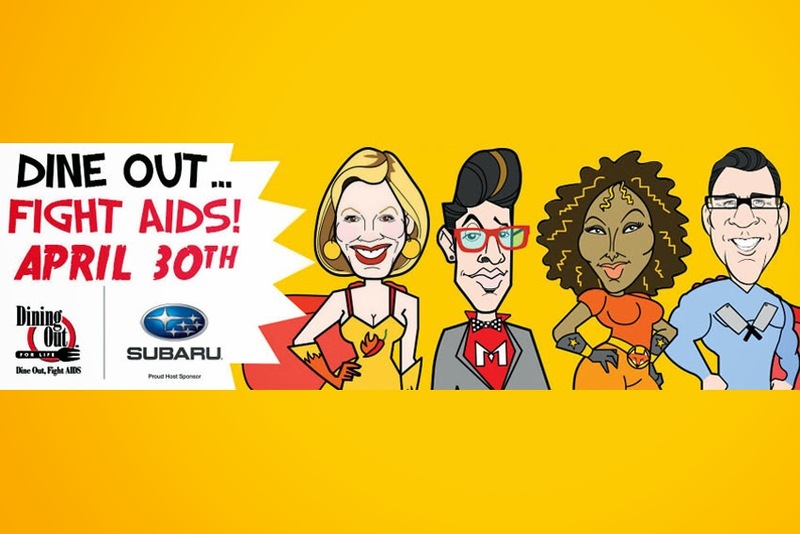 "2015 marks the ninth year that Subaru has hosted Dining Out For Life. We are proud to once again support this worthy event and to help regional organizations that provide crucial services to so many people affected by HIV/AIDS," said Alan Bethke, VP of Marketing, Subaru of America, Inc.
Volunteer celebrity spokespeople include designer Mondo Guerra, winner of Lifetime's Project Runway All-Stars, Ted Allen, host of Food Network's Chopped, actor Pam Grier (Foxy Brown, Jackie Brown) and chef Daisy Martinez from Food Network's Viva Daisy. Regions and cities celebrating on April 30, 2015 (or another day during the month of April) include Albany, Anchorage, Asheville, Atlanta, Baton Rouge, Birmingham/Mobile, Clearwater, Charleston, Chicago, Columbia, Denver/Boulder, Detroit, El Paso, Fort Collins, Grand Junction, Grand Rapids, Houston, Indianapolis, Jacksonville, Kalamazoo, Lake Charles, Memphis, Minneapolis/St. Paul, Nashville, New Haven, Norfolk, Northern Nevada, Palm Springs, Philadelphia, Phoenix/Prescott, Portland, Ore., Providence, Sacramento, San Diego, San Francisco, Seattle, Silicon Valley, St. Louis, Tacoma/Olympia, Tampa Bay/Orlando, Tulsa, Vancouver Island and Washington, D.C.